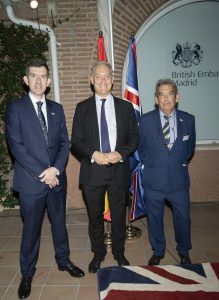 The historic imperial city of Toledo and the residence of the British Ambassador in Madrid were the settings for gatherings of Spanish based OS and parents organised at the end of September by Jimmy Burns OBE, the Anglo-Spanish President of the Stonyhurst Association. 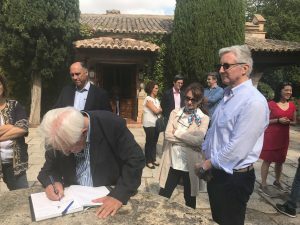 In Toledo, the Stonyhurst group were treated to an exclusive morning tour of the Cigarral de los Menores, a magnificent country estate outside Toledo with its beautiful cultural heritage house built on the site of a 17th century convent. 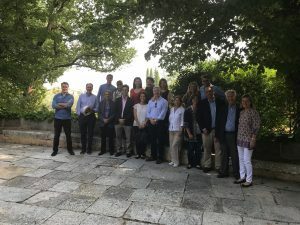 The estate was bought and renovated in the early 20th century by Jimmy’s late grandfather, the eminent Spanish doctor and writer Dr Gregorio Maranon, and is currently owned by the Marquis of Maranon. 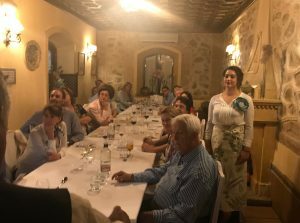 Following their visit to the Cigarral, the Stonyhurst group lunched in the VIP Golden room of the Venta de Aires, Toledo’s most historic and popular restaurant, whose past clients have included the artist Salvador Dali, the poet Federico Garcia Lorca, and the film maker Luis Bunuel. 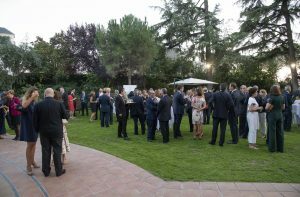 The next day Stonyhurst former pupils and parents joined the Headmaster of Stonyhurst College, John Browne, at the reception for about 200 guests of the charity the British-Spanish Society organised by its Chairman Jimmy Burns OS 1971 at the Madrid residence of Simon Manley, the British Ambassador to Spain. In his speech, John Browne paid tribute to the Spanish links of the Society of Jesus, from the early days of its foundation, Ignatius of Loyola, and celebrated the sense of Christian service and optimism he found in those educated at Stonyhurst.